Editors: Deardorff, Darla K., deWit, Hans and Heyl, John D., et.al. 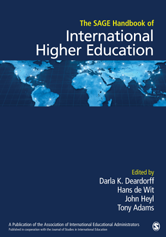 The SAGE Handbook of International Higher Education serves as a guide to internationalization of higher education and offers new strategies for its further development and expansion in the years to come. With a decidedly global approach, this groundbreaking volume brings together leading experts from around the world to illustrate the increasing importance of internationalization.